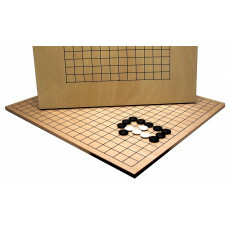 Gobang is a strategic board game for two players. 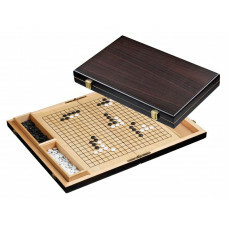 It is also known as igo (Japanese: 碁), weiqi (Chinese: 围棋) or baduk (Korean: 바둑). The game was invented in China more than 2,500 years ago, possibly much earlier, and is the oldest game in the world that is still played the same way. The game was a pleasure for the Chinese elite and counted as one of a learned person four haves, (the four arts). 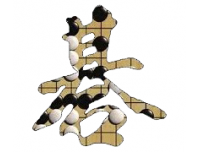 The four arts (Chinese: 四 艺, pinyin: Siyi), also called "the learned four arts", were skills that were considered no more than fitting for a scholar in ancient China: string instrument Guqin, the board game Weiqi (go), calligraphy and painting. 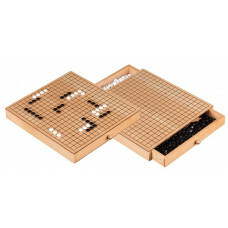 Go set, elegant design, AN 3224 / Go board made of MDF, red-brown stained, field 17 x 18 mm. Pieces made of urea, diam 13 mm. See "Specification" for detail.. Tournament board with 2 bowls, AN 3220 / Go board with feet made of maple, natural stained, field 24 x 22 mm. 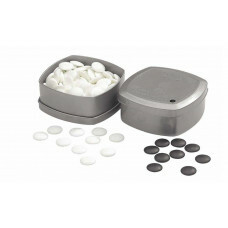 Plastic pieces, diam 21 mm. Two bowls made of cat.. 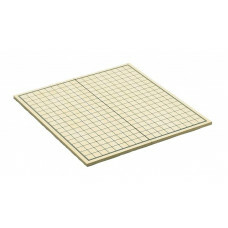 Tournament size foldable go-board, AN 3221 / Folding Go-board, in case design with handle. Made of poplar brown stained, with 2 stone-holders inside. Field siz.. 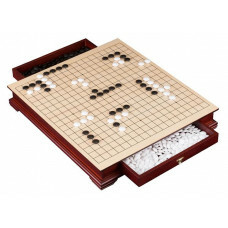 Tournament go-board with 2 drawers, AN 3227 / Go-board in table design made of basswood, natural and reddish brown stained, field 24 x 22 mm. Plastic pieces, d.. 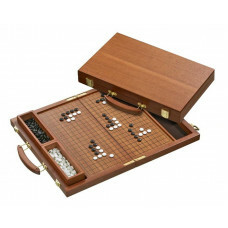 Tournament board with 2 boxes, AN 3210 / Go board foldable made of MDF, natural stained, field 24 x 22 mm. Playing pieces made of glass, diam 20 mm in plastic ..
Go-set with foldable go-board, AN 3211 / Folding Go-board, in case design with handle. Made of poplar brown stained, with 2 stone-holders inside. 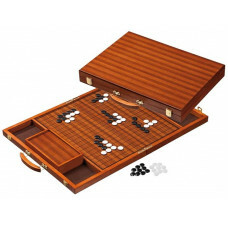 Field size 17..
Beginner go-board with 2 drawers, AN 3229 / Go-board in table design made of beech, natural stained, with tow drawers. Field 14 x 15 mm. 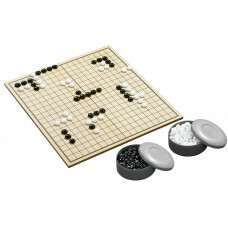 Plastic pieces, diam 1..
Go-set with foldable go-board, AN 3226 / Folding Go-board, in cassette design with clasps. Made of poplar brown stained, with 2 stone-holders inside. 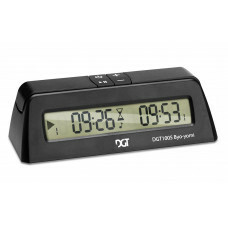 Field siz..
Digital Timer for Go and Shogi, AN 10913 / The high quality DGT-1005 Byo-yomi timer is a clock programmed with Japanese Byo-yomi timing options and especially ..
Go board folding, AN 3212 / Foldable board made of MDF size closed 455 x 212 x 20 mm. Playing field size open 455 x 424 x 10 mm. Field 22 x 24 mm. 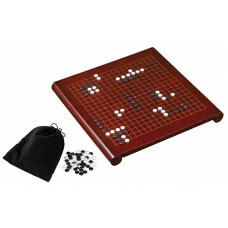 ..
Go pieces of plastic, AN 4304 / 360 Go pieces of plastic, 180 pcs in black and 180 pcs in white, in plastic-can. Diam 22 mm. 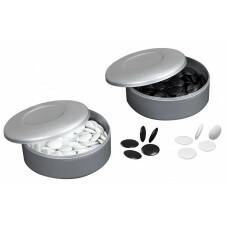 ..
Go pieces made of glass, AN 4301 / 360 Go pieces of glass, 180 pcs in black and 180 pcs in white, in plastic-can. Diam 20 mm. .. 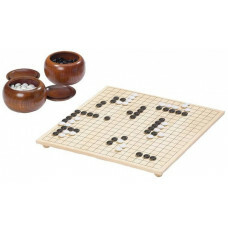 Tournament 2-sided go-board, 728007 / Go-board made of beechwood veneer. Two-sided board, the front side has 19 lines and the back side has 13 lines. Packed in.. 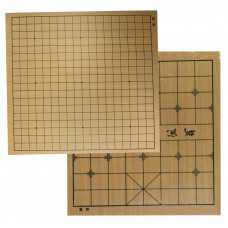 Tournament 2-sided go-xiangqi board, 728010 / Go and Xiang-qi 2-sided board made of beechwood veneer. Packed in white carton. 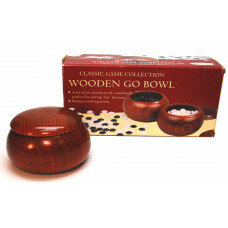 See "Specification" for detail..
Go pieces of Urea in wooden bowls, 729006 / 360 Go pieces of urea, 180 pcs in black and 180 pcs in white in two wooden bowls with lid, dark brown stained. 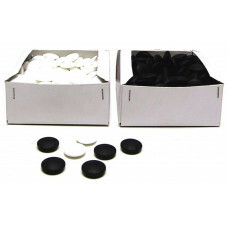 Diam..
Go pieces of glass in carton, 729002 / 360 Go pieces of glass, 180 pcs in black and 180 pcs in white in white carton. Diam 20 mm. ..